The parson made his way down the interstate, heading for the Quik Trip, America’s best gas and convenience store. About two miles from the exit he passed a RV camper of the vintage variety. It was from the early 1980s, the kind where a pickup was modified to accommodate the camper. It was towing an economy sedan from about the same year. 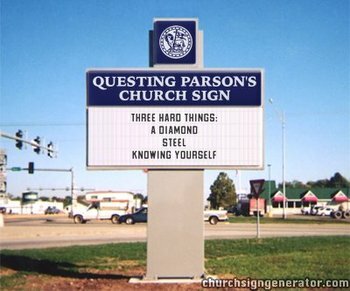 The parson quickly moved ahead and exited. He pulled into the Quik Trip and headed for the cappuccino dispensers. He no sooner had his cup filled than Eugene Jones entered the store. The two had agreed to meet here and ride to a meeting together. The parson waited for Eugene to get a cup of refreshment for himself and headed toward the cashier. Halfway there his attention was captured by someone walking in. The parson stared, knowing the man looked familiar. Then it hit him; he was the fellow driving the old camper. Eugene nodded as the parson pointed his car back toward the interstate. He crossed over on the bridge and headed toward the post office about a mile ahead. He made a quick trip around the parking lot and dropped the letters into the outside receptacle. Now the car was pointed back toward the interstate again. One hundred yards before the interstate, the parson saw the camper again. The parson pulled in, got out of the car and approached the man. Eugene followed. “What happened?” the parson asked. The parson was taking in the Quik Trip cup and sausage biscuit wrapping on the fender as the man spoke. “Thanks much,” said the man as he took the card from the parson.